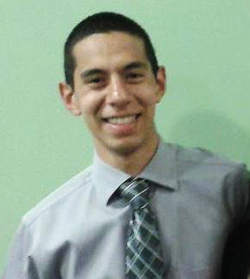 Sophomore Nick Granados-Kramer is a triple major in the College of Arts and Sciences and the School of Education. The Hyde Park, N.Y., native studies secondary science education, chemistry and physics, and has high ambitions to be a science teacher. His life is characterized by his propensity for giving back to his community, whether it is through teaching, peer advising or off-campus internships, and he has a clear passion for bettering himself by bettering those around him. Q: Academically speaking, you’re involved in a lot, but it all centers around your desire to teach. What is it that motivates you, and when did you first decide that teaching was what you wanted to do? A: I decided that I was going to be a teacher when I was in third grade. I remember coming home one day and just telling my parents that teaching was what I was going to do, and I haven’t changed since. Part of that is because I had such a great third grade teacher, and that inspired me to pursue a teaching career. I know I was young, but I’ve always been that person who sets their mind to things really early. I also believe that teaching is the best profession where you can actually help people. Q: All education majors have to student teach at local schools. What has that experience been like for you, and which schools have you worked in? A: My first placement was in Fowler High School, and that’s a very interesting place to be, especially for your first placement. There’s a low graduation rate, and tons of students are immigrants. The language barrier was shocking to me, because you’d expect maybe Spanish, but then you get there and every day you’re hearing Tibetan, Nepalese and German, too. However, despite all those obstacles, and maybe because of them, it was incredibly rewarding when the students actually learned. It was a great cultural and learning experience for me, too, and one of the students I taught last year is now actually a student here at Syracuse. I ran into her last semester and she called me out and thanked me. The other schools I’ve taught at are Manlius-Pebble Hill and Grant Middle School. Q: What kinds of internships have you had, and how have they impacted your professional and academic experience here at Syracuse? A: My mom is a social worker who works with developmentally disabled people, and I interned with her company, Dutchess ARC. The ARC stands for Advocacy, Respect and Community. I worked with their teen program over the summer, which was basically just a program for kids who needed something, anything, to do. So, we did a lot of day trips and hands-on activities. I remember one time I had to drive a 12-person van full of screaming children from Hyde Park to Connecticut. That was crazy. But in terms of day-to-day stuff, it was a lot of watching after people and working with them on behavior. Overall, it was an experience. That’s the best way to describe it. There were lots of ups and downs, but hopefully I’ll be able to do it again. Here at Syracuse, I’m a peer advisor for the School of Education. I like talking to new and prospective students because I’ve always enjoyed helping people figure out where they belong. Just talking to them about my experiences can usually give them a good indicator. Also, since my program is so small, with only 11 total students, peer advising is a lot of one-on-one work. You get a very personal connection from that, and in the long run that ends up being so beneficial. I had two peer advisors; one in Arts and Sciences and one in the School of Education, and you can probably guess which one I still keep in touch with. Q: Finally, why Syracuse? How did you end up here, and how do you feel about the experience so far? This story was written by Austin Galovski, a work-study student in the Office of News Services.